Chemical Transfer Hose - Acid Resistant Hose - Chemical Suction & Discharge Transfer Hose - Acid Suction & Discharge Resistant Hose - Chemical Industrial Hose - JGB Enterprises, Inc.
Chemical Hose / Acid Resistant Hose is available in almost limitless variations of chemical and acid-resistant tube/reinforcement/cover materials and thicknesses custom-engineered to handle most corrosive fluids. Acid and chemical transfer requires a hose that provides maximum safety and protection for materials being conveyed, and the environment in which they are conveyed. Chemical suction & discharge hose must not be used at temperatures and pressures above those recommended by the manufacturer. All operators must be thoroughly trained in the care and use of these hoses and must at all times wear protective clothing. JGB provides Chemical Hose / Acid Resistant Hose for Chemical Hose (Suction and Discharge) and Chemical Transfer Hose applications. Application: Applications include over 950 basic chemicals that are building blocks for numerous chemicals used in a variety of industries. Tank truck, barge, ship, or storage tank transfer of a variety of chemical products. Application: Applications include most basic chemicals which are building blocks for numerous chemicals used in a variety of industries. Tank truck, barge, ship, or storage tank transfer of a variety of chemical products. Application: Applications include over 450 basic chemicals which are building blocks for numerous chemicals used in a variety of industries. Tank truck, barge, ship, or storage tank transfer of a variety of chemical products. 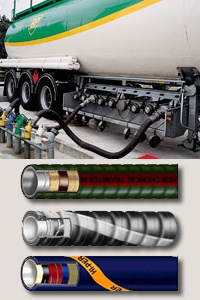 Application: A significant improvement to ContiTech’s chemical hose line. It handles the majority of common industrial chemicals in pressure, gravity flow and suction service. Application: A premium hose which is FEP (Fluorinated Ethylene-Propylene) lined to handle a broad spectrum of fluids and materials in a wide variety of applications. Application: For use in pressure, gravity flow and/or suction service. Hose may be cleaned using open-end steam up to 50 psi or in a bath containing 10% Sodium Hydroxide (NaOH), up to 212°F (100°C).